The cool thing about cars from Canada for the rest of us—like today’s Nice Price or Crack Pice Talon—is that both the odometer and the price end up being lower than you initially expected. Let’s see if, in this Canadian Eagle’s case, the latter is low enough. When I was a kid, my family took a trip across the country—in a VW Bus nonetheless—and one of the most memorable portions of the trip was the I-80 heading into Lincoln Nebraska. That seemingly endless ribbon of asphalt was bounded by farmland on either side, and divided by a grassy median in between. The flat, endless, heartland of America vistas through which the road was cut eventually became tedious as we passed field upon field without distinction, and nary a modest curve nor hillock appeared to break the monotony. What kept my attention however, was something that was also seemingly endless, and that was the quantity of roadkill peppering the highway. It wasn’t just dead animals, it was critters that had been turned into two-dimensional parodies of their former shapes. There were hares, foxes, masses of feathers and bone that were once likely very inattentive birds... I had never seen anything like it. It seemed like this one stretch of road was the apocalypse for small animals, a tiny elephant’s burial ground if you will. The worst of it was as we approached the end, Lincoln looming off in the distance. There, on the shoulder appeared first one dead sheep, and then another, and another, and then a fourth. Finally, laying in the waving grass just after them, was a herding dog. I was about ten years old when we ran through that open air abattoir, and I wear the emotional scars of the experience to this day. Last Friday’s 1987 VW Jetta with its Recaro seats and puny turbo diesel engine was also located in Lincoln, but that car thankfully proved to be far less disturbing. In fact, what it mostly proved to be was divisive as it came away with a tight 52%/48% Nice Price win. Any of you seriously considering buying that car should be forewarned and probably avoid the I-80 heading home. Just saying. In Canada there are much larger fauna to avoid on the road, what with all the deer, elk, moose, and impromptu street hockey games that make attentive driving a requirement there. 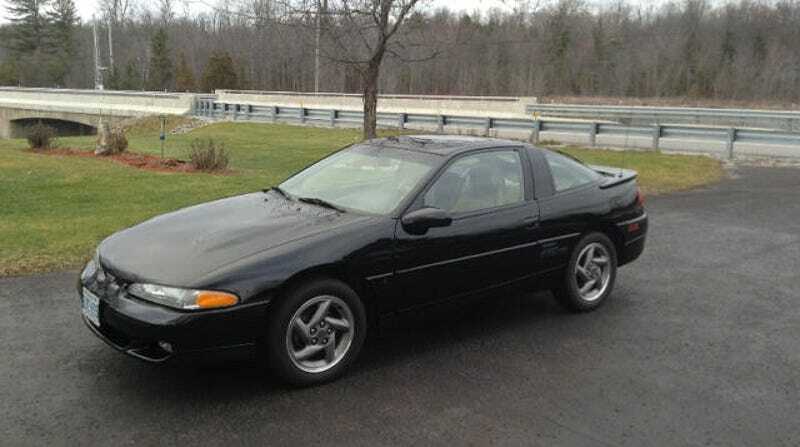 Those potential obstacles are part of the reason that the condition of today’s 1994 Eagle Talon AWD TSi is so amazing. You all remember Eagle, right? It was the Chrysler brand that arose for a short time in the ‘90s following the company’s purchase from Renault of AMC/Jeep, and all the baggage that implied. Chrysler really only wanted Jeep, but part of the bargain was to buy a bunch of cars and engines from Renault so they threw up their collective hands and said FINE! They even went ahead and added a few more models to Eagle, both from their own stable and stuff they were building with partner Mitsubishi. That turned the marque into the the equivalent of the Island of Misfit Toys. Not everything from Eagle was a castoff. Their LH car, the Vision, was pretty cool, and the Talon, which Car and Driver magazine touted as one of the Ten Best Cars in America from 1990 to 1992, provided some cred. That honor makes it pretty baffling that today you just never seem to find them in any sort of shape—much less in exemplary condition like this one. If you need a quick run-through of the specs, the Talson rides on a shared platform and is powered by a 195-bhp turbocharged and intercooled 4G63T DOHC 2-litre four. There’s a five-speed stick backing that up, and power is transmitted to all four tires. The DSM cars (Talon, Mitsu Eclipse, and Plymouth Laser) were all built at the joint venture plant in an Illinois town which the awesome name of Normal. The TSi was the top of the line Talon and befitting that, this one has a leather-swathed interior. That beige and black environment looks terrific and appears to come with one of those factory radios with a ton of tiny buttons and a multi-band graphic equalizer. Also, this being a Canadian car, I don’t think it has mousebelts, which would be a bonus. On the outside you’ll notice that this is one of the restyled first-gen cars which replaced the pop-up lights with fixed units and tarted up the backend with restyled taillights. It all still looks pretty good today. While it may live in Canada, the ad for this Talon claims it’s never seen a winter, and the modest 85,000 kilometers on the odo (about 53,000 miles) backs that up. The seller says there’s no rust on the car, and that he has all the maintenance records, if that’s your thing. What else might be your thing is the $8,900 price tag. That too comes out lower in American dollars, around $6,730 U.S.
As I noted earlier you just don’t see Talons in this kind of shape all that often any more. The question is, would that scarcity and condition make it worth its present asking? Kijiji out of Peth ON, or go here if the ad disappears. H/T to Christian Mainville for the hookup!